Perhaps it was the childhood diet of dance films, perhaps it’s the spicy lure of a classic masala entertainer … whatever, I love Bollywood. This is not a film to take seriously. This is a film for eating popcorn, singing along and doing Amrish Puri scary eyes at apposite moments. It could be a drinking game (twins! flute! Madhuri Dixit in a ghagra! unrealistic fight sound effects!). 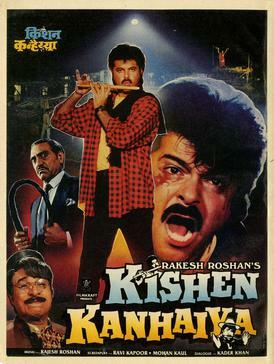 We know, because we’ve seen the first three minutes, that Kishen and Kanhaiya (Anil Kapoor in full ‘tache-throb style) are twins separated at birth. But! This secret is the set-up for the whole film. I don’t think I have the willpower to type out the whole ham sandwich, but the ingredients include an evil stepmother, a father paralysed so that he can only move his eyes (!) and … well, Uncleji Amrish (“I always knew he were a bad ‘un”). Kishen is a wet blanket who marries a milkmaid after playing her the one song he knows on the flute. His family are waiting for him to turn 25 so that once he inherits eye-moving Dad’s property they can bump them both off (and Amrish can cackle in a victoriously menacing manner). Fortunately, Kanhaiya, growing up p-o-o-o-r somewhere else, is a layabout who watches so many Bollywood films that he can bust out all the fight moves and cheese-tastic one-liners. Madhuri has seen all the films, too. And so we arrive at the romantic confection of robot, running man and pink that is Aap Ko Dekh Ke. Various things must then transpire. This includes the perennial Indian entry for Mr Irritating, Johnny Lever (sporting a Charlie Chaplin ‘tache). It also includes a subplot about missing money, a kind of telepathic twin-ness wherein Kanhaiya feels Kishen’s pain, and a slapstick car chase. By this stage, Kishen is dead-but-not-really and Kanhaiya is impersonating him. Cue Suit Boot Mein Aaya Kanhaiya, aka Anil does Iko Iko. Then before we know it (or two and a half hours later), it all ends with the baddies in the mud. Hurrah! And eye-moving Dad moves a hand! And we, you, or indeed I, are left with the suspicion that it may either be one of the greatest films ever made, or our brains have fallen out our ears.